These chewy glutinous rice balls do pair very well with the red bean sweet soup and I'm beginning to favour this over the traditional plain coloured ones in clear, sweet syrup. Boil 4 cups of water and once boiling, add in the red beans and pandan leaves. Lower heat and keep covered. After about 20 mins. add in the palm sugar and keep stirring. Return the red bean soup to the boil, but lower the heat. Add in salt. Once the beans turn soft, fine tune to desired sweetness and peferred consistency. (This sweet soup is not watery but a bit thick). Mix the glutinous rice with enough water to form a pliable dough and prepare the tong yuen. Click 'here' for the method. 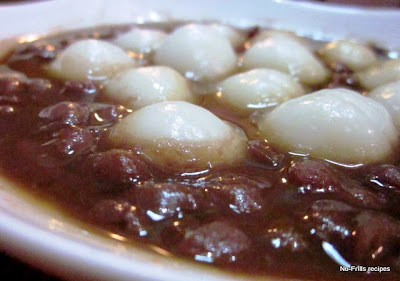 Ladle the red bean sweet soup onto serving bowls and add in the tong yuen. good morning cheah, this will be especially good with tong yen with o fillings too! btw, i wish that i cld hv your mango trifle for dessert later. Happy tong zhi festival and happy new year to you! red bean soup and tong yuen.. wow! my favourite. I completely forgot about today is the Dongzhi ;-)) The sweetened bean soup with tangyuan looks so good! Cheah, I did not make tangyuan this year. Just bought those frozen type but your homemade tangyuan looks so good. Must made some on 'yuan xiao'. I didn't celebrate dongzhi this year so didn't make any, your version is something new to me, looks delicious! Very unique way of serving tang yuan! May prepare some during the Christmas break. Merry Christmas to you and your family! Can't believe it is already end of 2011 and Chinese New Year is just one month away. haha.... Hoping the coming 2012 will be a blessed one. However, hope you're all well. Take care & Happy 2012. Wish you and your family a very Happy New year too! Thanks for dropping by. There are many variations of tong yuen nowadays. Yes, some people will make tong yuen for New year's eve dinner too. Thanks. Happy new year to you and your family too. Thank you. Yes, just want to make something different. Yes, in less than a month, it's CNY. All the very best for 2012. Yes, I heard my late mum said that too. Cheah, have a blessed New Year 2012. Looking forward more yummy food from you.